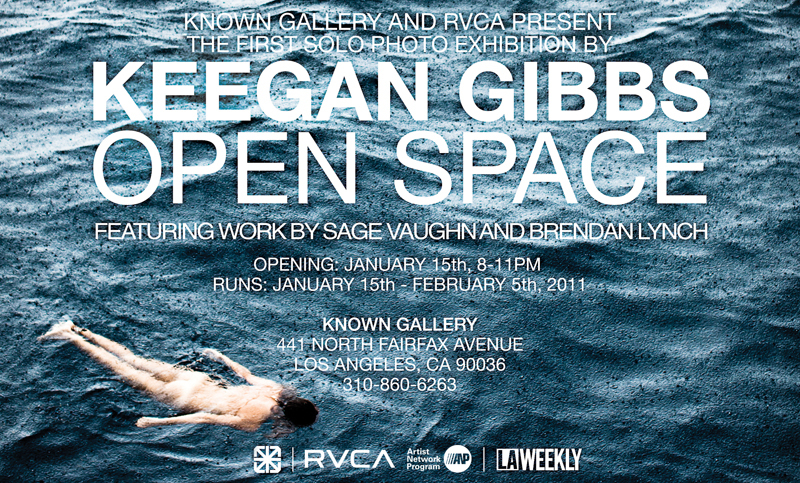 Keegan Gibbs has traveled all over the world in his role as one of the principal photographers for the Seventh Letter graffiti crew, so it is only natural that the Known Gallery chose to host his debut photography exhibit. Known Gallery director Casey Zoltan comments “I really respect his work ethic and his dedication to capturing the moment at any cost.” Fear has no place when shooting images of the renowned Seventh Letter artists in action fifty feet above ground at 2 AM whilst dodging headlights and billy clubs. Likewise fear has no place while shooting film in the treacherous and sometimes deceptively peaceful oceans of the world, the featured subject of this exhibit called OPEN SPACE. ABOUT KEEGAN GIBBS: Born in a family of artists, Keegan Gibbs was literally skateboarding and bicycling while still in diapers (his parents have video to prove it). Raised by the ocean, this aquatic biped found the best way to express his love of all things salt water, was through photography. When not shooting, his main goal is to surf as much as he possibly can and to find the hollowest tube, the longest wave, and the most crackable lip. Very cool… Are you planning on selling prints anytime soon? I really love your work! Congratulations on your success on Saturday night in LA!!!!! See you at the top sir! Regret not going to the opener but I went by today “breath taking!” The party was awesome..I wanted to chill and read through the magazines…lol!! But yeah Im bug fan of your work and I hope for success bro. Regret not going to the opener but I went by today “breath taking!” The party room was awesome..I wanted to chill and read through the magazines…lol!! But yeah Im a big fan of your work and I hope for success bro.